Tonight (Wednesday, 10/20) a legend of hip hop comes to Roanoke performing at Awful Arthur’s Tower’s location. 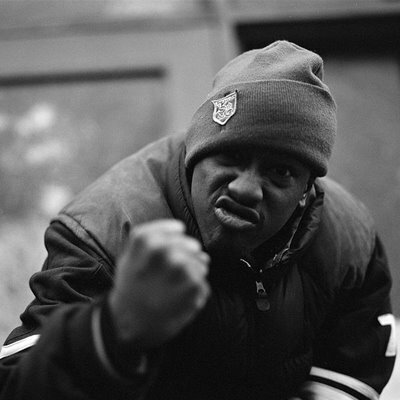 Keith Murray, known for his hit “The Most Beautifullest Thing In This World” is making Roanoke a stop on his The Most Beautifullest MC Tour 2010. Along for the tour is special guest and Vermont based rapper, Burnt MD. Opening the whole show will be Roanoke based hip hop duo Mack Jones (Poe Mack & Case Jones). This show starts at 9pm and will run late, get out and see GOOD hip hop in Roanoke! On Friday (10/22) Roanoke’s new comedy club gives you two hilarious acts. 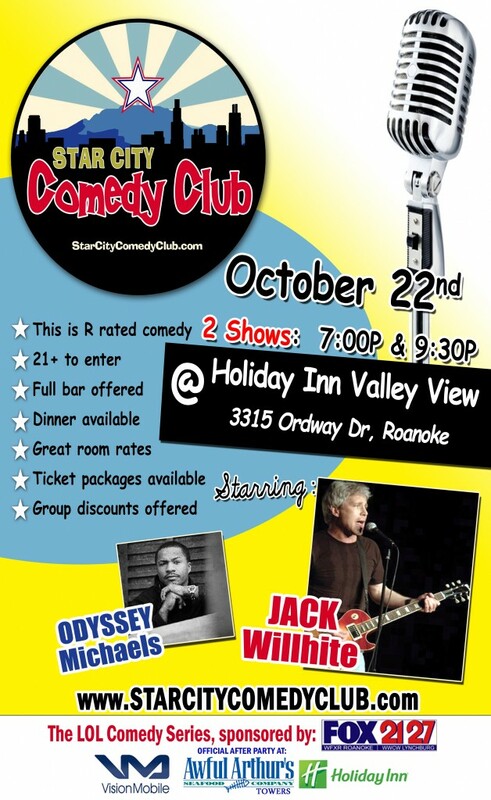 Star City Comedy Club, located at the Holiday Inn at Valley View will host comedians Odyssey Michaels and Jack Willhite. The evening starts at 7pm with the first show and 9:30m with the second. You must be 21 to enter and full bar is offered. 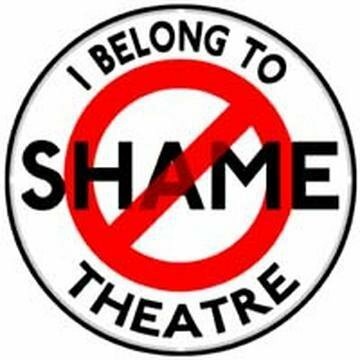 On Saturday the 23rd the seemingly re-opened Mill Mountain Theatre will host the Best of No Shame Theatre. Featuring up 23 of the year’s best five minute original pieces the event will start at 8pm. Nancy & 2 Meteors will be opening with a pre-show that’s worth going for alone! Although the price of the event may seem a bit steep at $15 there is an option to get advanced tickets for $10. The amount of material alone is worth going for. Head down to Market St. at 8pm and catch the best No Shame has to offer! 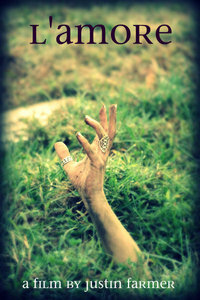 Also on Saturday (10/23) the Bazaar on Brandon Rd will be throwing a folk show sure to please. Portland, Oregon three-piece symphonic folk act Ah Holly Fam’ly will be sharing the evening with Roanoke and Magic Twig Community folk ensemble, the Missionaries. Come out, gather ’round, have some warm coffee or tea and listen to two great folk acts sing, laugh and tell stories for all. This show starts at 9pm and only $5. On Monday (10/25) Roanoke’s own community microcinema the Shadowbox will be hosting a locally made horror film. Roanoker and local filmmaker Justin Farmer directs L’amore taking place in the wilderness with the Blue Ridge Mountains as the back drop. Four friends decide to take a camping trip together only to wake up stuck in the middle of a zombie outbreak. The film starts at 8pm, the Shadowbox is located on Kirk Ave in downtown Roanoke. Thursday night (10/28) local artist Dickie Eikcid will be performing and hosting an installation entitled ssplatter. This event will take place on the second floor of the Just Embrace Love Please gallery on the corner of Kirk Ave & 1st. 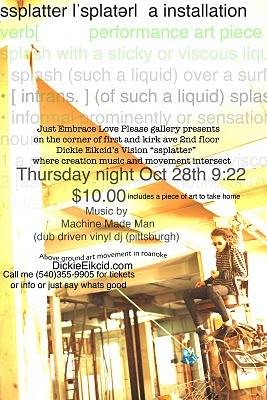 Dickie will be creating pieces to the music of Pittsburgh DJ Machine Made Man. Starting a little after 9pm and costing you $10 which includes a painting to take home with you. 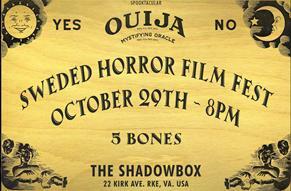 On Friday (10/29) the Shadowbox will be showing their long awaited Sweded Horror Film Fest. Taking inspiration from Michel Gondry’s Be Kind Rewind the Shadowbox has decided to invite local wanna be filmmakers to come up with their own short no budget recreations of their favorite horror films. This should make for a very funny evening in celebration of Halloween. This event starts at 8pm and will cost you $5. 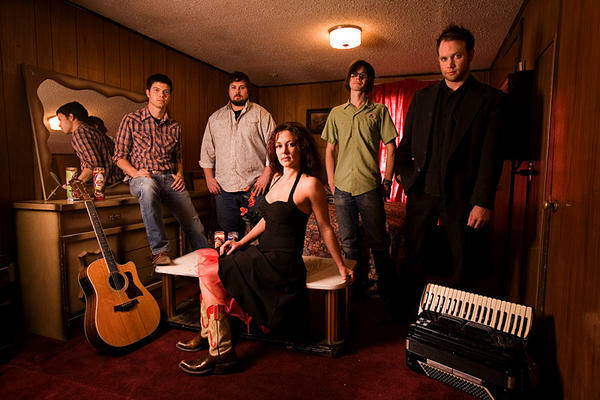 That same Friday (10/29) the Bazaar will host Texas band Thrift Store Cowboys. Described as ambient gothic roots music the Thrift Store Cowboys have played with such great acts as Willie Nelson, Deertick, Magnolia Electric Co. and more. This show starts at 9pm, $5. The very next day (Saturday the 30th) the Bazaar invites you to come and celebrate Halloween with them by throwing an awesome dance party! Danger Fangs Masquerade will be a night of dressing up, dancing and fun with djs Turbo P and DJ Kimchi. The event is free IF you wear a costume or its $3. Starting at 9pm and going late this should be a fun night for all. 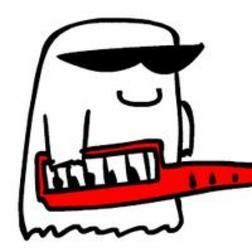 Also that Saturday (10/30) Roanoke’s comedy/ rap trio the Illbotz continue their Monster Tribute Halloween Bash tradition at Awful Arthur’s Tower’s location. 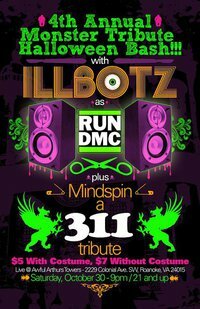 The Illbotz will be there of course as Run DMC with special guests Mindspin as 311. $5 with costume and $7 without this show starts at 9pm and is 21 and up only. Closing out the month and the Halloween festivities is something very, very awesome! The Shadowbox will be showing the cult classic and arguably the best musical ever, Rocky Horror Picture Show. Starting at 10pm on Saturday the 30th the showing will feature a live cast and audience participation. No need to bring anything, survival packs will be included! 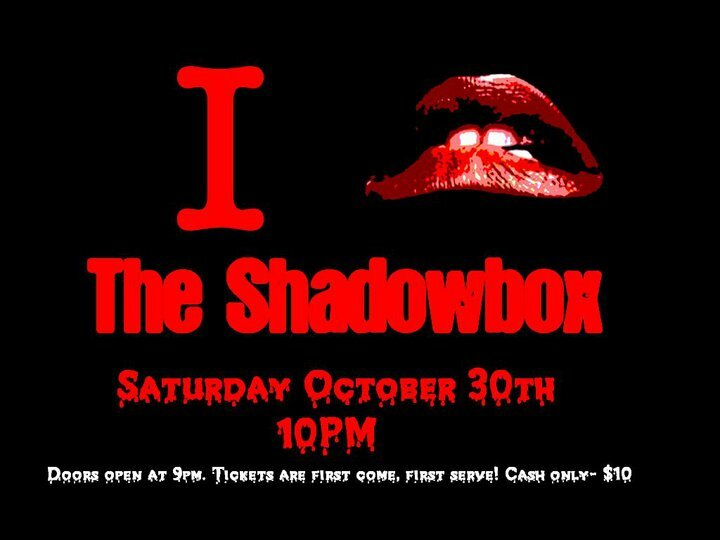 Come in costume and have fun with the Shadowbox crew! Tickets are $10, cash only.